Step-by-step instructions on how to add video thumbnails (tooltip) to Clips. • Previous understanding on how to create/edit Clips. 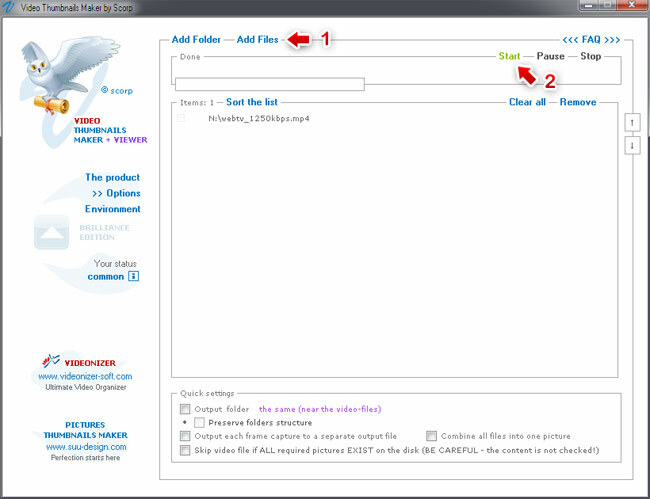 • Version used for the screen captures: WS.WebTV Professional 1.4.1 (all extensions enabled). Some options/features might be different, respect your WebTV, depending on the installed version and extensions you have purchased. WS.WebTV supports video thumbnails; which is a preview made of images of a video. The preview is displayed in a tooltip (mini window) when a user hovers the progress bar of the video player. This allows to do a "visual seek" and it is specially useful for locating a specific time in long-length videos. "Auto-Encoding" Clips can generate the video thumbnails automatically from the "source" video file. This tutorial is mainly intended for the cases of "Standard" or "StreamClip VOD" Clips or when you want to generate, manually, the video thumbnails. A sprite is a single image file which contains all the video preview thumbnails. WS.WebTV uses "WebVTT " files in order to display the individual video thumbnails. A WebVTT file is a plain text format that contains links to the thumbnail image file, as well as the coordinates of each individual thumbnail. Please, note that the WebTV will only "read" the coordinates from the WebVTT file, and ignore the image file link, because it will use the image uploaded from the Content Administration interface. • The range of time the thumbnail represent (respect the video duration). Note: The time ranges need to be in the following format: (hh:)mm:ss.msmsms (hours:minutes:seconds.milliseconds). • The name/link of the sprite image, with the coordinates of the thumbnail (remember that the WebTV will only read the coordinates). Notes: The coordinates are specified using a "spatial Media Fragment ". The image name/link, although it will be ignored, must be included. • Image File: The sprite image. • VTT File: The WebVTT file. Once you are done click the Save button. 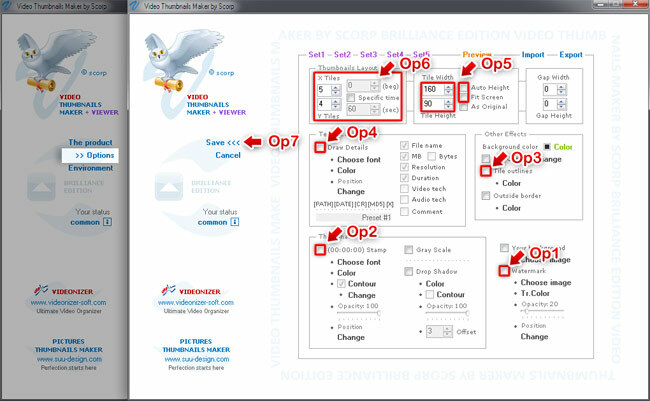 Video Thumbnails Maker is a great (and cheap) program that allows you to create automatically, from video files, the corresponding sprite (thumbnails image) and VTT files. Before processing your video files, the first you need to do is to set the correct settings in "environment" and "options" screens. - Env1. Check "Classic" and "WebVTT" checkboxes. - Op3. Uncheck "Tile outlines"
- Op4. Uncheck "Draw Details"
- Op5. Set Tile width = 160 and Tile height = 90; uncheck "Auto Height" and "Fit Screen"
- Op6. Set the appropriate values into the "Thumbnails Layout" section. Note: These settings will depend on your video duration. You can either configure the program to generate a thumbnail (tile) at a specific time interval or by specifying the "X Tiles" and "Y Tiles" values (for example 5x4 = 20 thumbnails/tiles). Warning: Generate sprite images of reasonable size. Avoid having more than 100 or 120 thumbnails. More thumbnails will allow a better sampling (for long-length videos), but will result in a bigger sprite image. 2) When ready, Click "Start". When processing is done, an image and vtt file will have been generated for each video; now upload them to the WebTV as explained above.